As one of Australia’s best tourism experiences, Port Arthur Historic Site is both nationally and internationally significant . It is the best-preserved convict settlement in Australia and a place that everyone should visit to discover our convict past and connect with the history and the stories that have shaped our region, state, and nation. Port Arthur Historic Site is the perfect place to take your friends and family who are visiting over the holiday period– so go and immerse yourself in the fascinating tales of Tasmanian history. It’s a gorgeous drive down the Tasman Peninsula and there is so much to do when you get to Port Arthur. There really is something for everyone. The BCFM Committee would like to thank Port Arthur Historic Sites for their generous sponsorship of the Cook Book and encourage all our readers to schedule a visit to Port Arthur Historic Sites this summer. There are lots of special summer activities for the whole family, including family friendly ghost tours, family fun activities at the Education Centre, Port Arthur History Plays and opportunities for kids to try their hand at some traditional trades, such as brick laying and stone masonry. Kids can also get a copy of the free Hidden Stories activity book. There is also a Champagne Cruise running on Friday and Saturdays and Devonshire Tea at the Visiting Magistrates House. Port Arthur Historic Sites contributed this beautiful recipe for Wallaby Pie, and the simple pepperberry sauce is an easy and luxurious addition that complements the pies beautifully. This recipe makes a pie to serve four people, but could be easily adapted to make individual pies instead. Dice wallaby into 1cm cubes. Brown cubes in a hot frying pan until sealed on all sides. Remove from pan and set aside. Lightly brown sliced onion and sliced bacon. Add the peeled and diced potato and tomato paste, cook lightly and then deglaze the pan with white wine. Add the stock and thyme, cover and cook for 40-45 minutes. Add the mushrooms and cook for a further 5-10 minutes. Season with salt and pepper to taste. Preheat the oven to 180°C. Roll out the pastry into two pieces, to fit the base and top of the pie tin. Line the base and sides of the tin with pastry. Cover with baking paper and fill with pastry weights. Bake blind for approximately 10 minutes. Remove paper and weights, place the wallaby mix into the cooked base and cover with the pie top. Seal the edges and decorate with surplus pastry if desired. Bake for approximately 15 minutes for individual pies or 30 minutes for a larger pie, or until golden brown. Heat the wine and stock in a heavy based saucepan over low heat and reduce until only 1/3 of the mixture is left. Add the cream and cook for 2 minutes. Add the pepperberries and reduce until the desired consistency is reached. Add salt and pepper to taste. 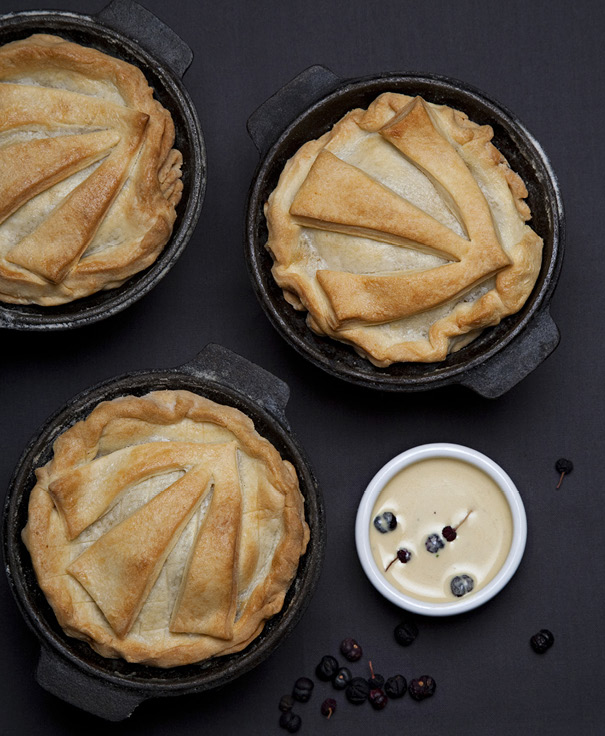 Serve the wallaby pies with a light salad and pepperberry sauce on the side. You can use shop bought shortcrust pastry for this recipe or make your own. If using shop bought pastry, try buying the shortcrust pastry in a block as you will be able to roll it more thickly to line the pie tins. To make your own shortcrust, place 240g plain flour and 180g cold, cubed butter into a food processor. Pulse until the mixture resembles fine crumbs. With the motor still running, slowly add very small amounts of ice water until the mixture just starts to form a ball. Remove from the processor, knead briefly to bring it together, shape into a flat disc and wrap in clingwrap. Rest in fridge for 30 minutes and proceed with the recipe as above.